The finest example of this map we have ever encountered. Mappe-Monde Dresse sur les Observations de Mrs. De L'Academie Royale des Sciences et quelque3s autres et sur les memoires les plus recens Par M. De L'Isle. 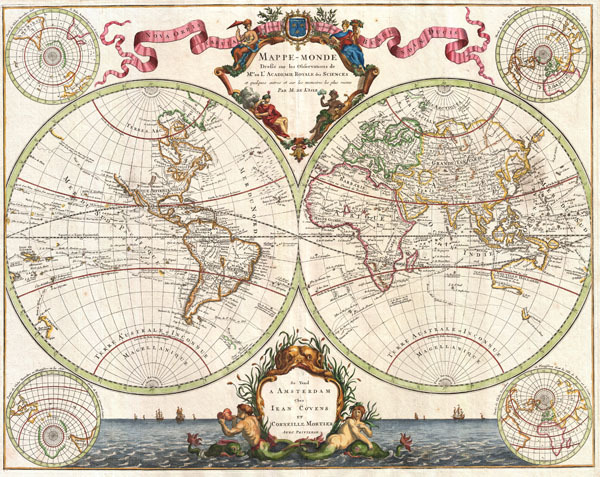 Published by the venerable Covens and Mortier firm, this is an exceptionally beautiful example of Guillaume de L'Isle's important c. 1730 map of the world in two hemispheres. The map consists of two central hemispheres, eastern and western, surrounded by four smaller polar projections. At top center there is an elaborate decorative cartouche with various allegorical elements. The entire bottom of the map is dominated by an allegorical seascape. Cartographically this map is altogether fascinating and exemplifies De L'Isle's careful scientific style of cartography. Starting in North America we find a number of cartographic advances attributable to De L'Isle's cautious style. California has been reattached to the mainland of North America following the discoveries of the Kino expedition of the early 1700s. The northwestern part of North America, still largely unexplored, has been left blank, though the lands supposedly discovered by Jean de Gama do peak out from the Asian side of the map. In the better known parts of North America the Mississippi is clearly mapped with its major tributaries, the Ohio and the Missouri noted. The Rocky Mountains make an embryonic appearance north of Santa Fe. The Great Lakes are fairly well mapped following the model established by V. Coronelli in the late 17th Century. Far to the north, the Hudson Bay and Baffin Bay, along with Greenland, form a closed series of seas with minimal suggestion of a Northwest Passage. De L'Isle offers only one possible route westward, an opening in the northwestern part of the Hudson Bay, which is labels 'Ne Ultra' or 'Nothing More.' De L'Isle's clear rejection of a Northwest Passage to the Pacific is a bold move for the period. This decision set him in direct opposition to the colonial powers, particularly England and France, who were actively searching for just such a route. The important cities of New York, Quebec, Montreal, Charleston, St. Augustine, Santa Fe, and Boston are identified. South America is typically well mapped along its coast which is in sharp contrast to its vague and speculative interior. Nonetheless De L'Isle does make a number of advances over earlier maps. He does away with Raligh's Lake Parima and El Dorado, commonly rendered in Guiana, while at the same time advancing a more significant Lac de Xarayes. De L'Isle's large and prominent Lac de Xarayes is rendered as the northern terminus of the Paraguay River. The Xarayes, a corruption of 'Xaraiés' meaning 'Masters of the River,' were an indigenous people occupying what are today parts of Brazil's Matte Grosso and the Pantanal. When Spanish and Portuguese explorers first navigated the Paraguay River, as always in search of El Dorado, they encountered the vast Pantanal flood plain at the height of its annual inundation. Understandably misinterpreting the flood plain as a gigantic inland sea, they named it after the local inhabitants, the Xaraies. The Laguna de los Xarayes, accessible only through the Gate of Kings, almost immediately began to appear on early maps of the region and, at the same time, took on a legendary aspect. The Lac or Laguna Xarayes was often considered to be a gateway to the Amazon and the Kingdom of El Dorado. Moving across the map to the Eastern Hemisphere we are immediately struck by De L'Isle's innovative and fascinating rendering of the discoveries in the South Pacific including Australia (Nouvelle Hollande), New Zealand, New Guinea, Vanuatu and the Solomon Islands. Earlier editions of this map featured a large hypothetical polar landmass called Terre Australis. Terre Australis was a massive continent conjectured to occupy much of the Southern Hemisphere. It was commonly believed that Terre Australis must exist to counterbalance the great weight of the Asian continent in the Northern Hemisphere just as the Americas counterbalanced Europe, Africa and Asia. De L'Isle has here removed the polar Terre Australis and instead joins the largely unexplored Australia (Nouvelle Holland) with New Guinea and even goes so far as to suggest a possible connection with another landmass, most likely Vanuatu, called Terre Australe de S. Espirit. This curious move essentially relocates Terre Australis from the southern Polar region to the South Pacific. Much of this erroneous geography hails from the misguided explorations of the Spaniards Mendana and Quiros. Mendana discovered, then subsequently lost, the Solomon Islands in 1567 and is responsible for their inflated size on many maps, including this one. Pedro de Quiros, Mendana's pilot, lead his own expedition to the region shortly following the Mednana expedition and, though he was unable to rediscover the Solomon Islands, did land on the southern island of Vanuatu, which he named Terre Australe de S. Espirit, expressing in the naming his belief that he had at last discovered the conjectural Terra Australis. Asia too exhibits a number of interesting advances over previous mappings. First, De L'Isle does away with the popular Lake de Chimay, a hypothetical source for the great river systems of Southeast Asia. The Caspian Sea, though misshapen is correctly realigned along a north-south axis. Korea is firmly peninsular and is separated by Japan by the Mer Orientale. Curiously Japan, via Hokkaio (Terre d'Yeco) is attached to the Asian mainland. Just to the northeast of Japan, separated from the mainland by the Detroit d'Uries, we find Terre de La Compagnie and, extending to the opposite side of the map, Terre de Gama. Often mapped together, these lands, Gama and Terre de la Compagnie, were islands supposedly discovered in the 17th century by a mysterious figure known as Jean de Gama. Various subsequent navigators claim to have seen these lands, but it was left to Vitus Bering to finally debunk the myth. In 1729, Bering he spent three days in the region looking for Juan de Gama's island but never found it. Thought some speculate that Gama and Compagnie may be little more than a mis-mappings of Hokkaido or the Japanese Kuriles, these curious islands remained on maps for about 50 years following Bering's voyages until the explorations of Cook confirmed the Bering findings. Africa, like South America, is well mapped coastally but exhibits a conjectural and tentative interior cartography. Nonetheless, true to form, De L'Isle does make a number of advances. Most significantly, De L'Isle does away with the traditional Ptolemaic two-lake theory regarding the source of the White Nile and instead sends the White Nile eastward toward the Niger. The idea that the White Nile has a Sub-Saharan source to the west was a popular interpretation of early texts on the region through rarely appears on maps – this being the exception. Throughout De L'Isle painstakingly renders the routes of various explorers including Halley, Magellan, de Schonten, Medana, Quir, Maire, Tasman, Pslsart, Chaumont, Dampier, Gaetan, Dudley, L'Ovilier, and many others. He also notes the curious and often speculative lands many of these explorers discovered, including Halley's glaciers, the Isle de Saxembourg of Linderman Holl, David Anglois' discovery in the south pacific (Easter Island? ), the Island of Vaginas (a proto Hawaii? ), and many others. The Sargasso Sea, the Grand Banks, and the glaciers of the Antarctic are also noted. There are also four smaller polar projections situated at the corners of the maps. The right hand projections focus on the Northern Hemisphere while the left hand projections depict the Southern. It is noteworthy that both Southern Hemisphere projections indicate Terra Australis – suggesting that they were not updated with the main map. Elaborate decorative cartouche work, including a stunning seascape, illustrates the upper and lower quadrants of the map. The primary title cartouche, top center, features the four great continents represented in allegorical female form, from top left: America, Europa, Africa, and Asia. Covens and Mortier's impression appears at bottom center in the mouth of a great sea monster or leviathan. A merman and a mermaid appear below the cartouche. To either side of the lower cartouche vessels of exploration ply the seas. This is the finest example of this map we have ever seen in either public or private collection. If you are planning on adding this map to your collection, this is the one you want. Very good near flawless example. Original centerfold. Blank on verso. Shirley, Rodney W., The Mapping of the World: Early Printed World Maps 1472-1700. 603, 581 (first state). Boston Public Library, Leventhal Map Center, G3200 1732 .L5x.